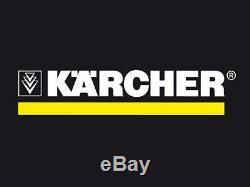 KARCHER WET & DRY VACUUM CLEANER 1800 WATT WD 5 PREMIUM 1.348-236.0. The WD 5 Premium (previously MV5) is an extremely powerful and efficient high volume vacuum cleaner with a 25-litre stainless steel container, a flat pleated filter in a removable filter box, filter cleaning etc. Patented filter removal technology Quick and easy removal of the filter from the filter box without contact with dirt. For wet and dry suction without changing the filter. 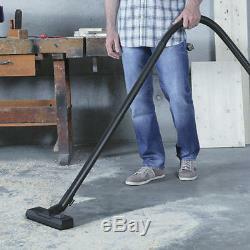 Newly developed floor nozzle and suction hose For perfect cleaning results, with dry or wet, fine or coarse dirt. For maximum convenience and flexibility when vacuuming. 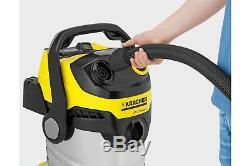 Removable handle Offers the possibility of attaching different nozzles directly on the suction hose. For easy vacuuming even in the tightest of spaces. Exceptional filter cleaning Powerful pulsed air blasts move the dirt from the filter into the container at the push of a button. Suction performance is quickly restored. Practical blower function The practical blower function helps wherever vacuuming is not possible. Drain screw Time and energy-saving emptying of large amounts of water. Practical parking position Quick and convenient temporary storage of suction tube and floor nozzle during breaks. Practical cable and accessory storage Space-saving, safe and easy-to-reach storage of suction hose, connection cable and accessories. Patented 3-in-1 carrying handle Convenient transport of the unit. Easy and fast container opening, closing and emptying. Real suction power (Air Watt) 240. Nominal accessory size (mm) 35. Type of current (V/Hz) 220 240 / 50 60. Weight without accessories (kg) 9. Dimensions (L x W x H) (mm) 418 x 382 x 694. Measured by the suction tubes according to the standardized IEC 60312 method of measurement. Suction hose, 2.2 m, 35 mm. Removable handle with electrostatic protection. Suction tubes, 2 piece(s), 0.5 m, 35 mm. Wet and dry floor nozzle, switchable floor nozzle with 2 rubber & 2 brush strips. Flat pleated filter, in removable filter cartridge. Fleece filter bag, 1 piece(s). Accessory storage on the device. _vacs supplys only Quality products with a huge range in floor care and the commercial cleaning industry. Dta provide discounted prices but only sell genuine quality products with satisfaction guantnteed. All our products are brand new. Bank A/C details ar available on checkout. All item prices include GST. While all care is taken, any errors or omissions in the item details is unintentional. All pictures contained within this listing are for illustration purposes only. Pick-ups are possible with prior arrangements only (No exceptions). Dta is not directly liable for any loss, theft, or damage to any goods. 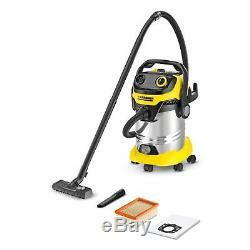 The item "KARCHER WET & DRY VACUUM CLEANER 1800 WATT WD 5 PREMIUM 1.348-236.0" is in sale since Saturday, August 6, 2016. 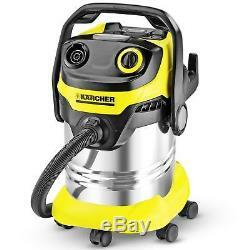 This item is in the category "Home Appliances\Vacuum Cleaners\Canister Vacuums". The seller is "dta_vacs" and is located in vic. This item can be shipped worldwide.